MINSK, 23 March (BelTA) - Metropolitan Filaret, the Honorary Patriarchal Exarch of All Belarus, was awarded the Order of St. Alexis, the Metropolitan of Moscow, First Class, of the Russian Orthodox Church, BelTA has learned. On behalf of Patriarch of Moscow and All Russia Kirill the order was presented to the Honorary Exarch by Metropolitan Pavel of Minsk and Zaslavl during the gala evening on the occasion of the 80th anniversary of Metropolitan Filaret. 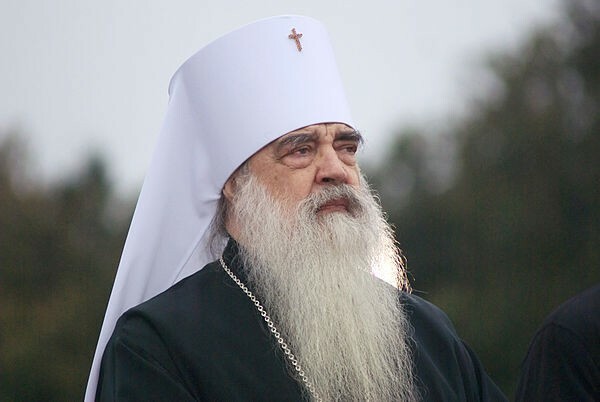 “The mere list of the posts that Metropolitan Filaret held during his half a century hierarchical service clearly illustrates that he is an extraordinary personality who has made a great contribution to the life of the Russian Orthodox Church in recent history. We highly appreciate the creative work of the Honorary Patriarchal Exarch aimed at the development of the eparchies and parishes of the Belarusian Orthodox Church. Metropolitan Filaret has always paid due attention to the spiritual and moral upbringing of the younger generation, to the constructive interaction with secular authorities, science, education and culture,” Patriarch Kirill said in the message of felicitation. The education activity of the Honorary Patriarchal Exarch of All Belarus Filaret, his great personal contribution to the spiritual rebirth of the Belarusian and Russian peoples was marked by high state awards: Medal and Order of Francysk Skaryna, the orders of the Fatherland Third Class, Honor, Friendship, Russian order “For Merit to the Fatherland” Fourth Class and others. He was elected honorary citizen of Minsk in 2003 and of Polotsk in 2004. In 2006 Metropolitan Filaret was awarded the Hero of Belarus title. In recognition of the great personal contribution to the revival, preservation and development of the cultural and spiritual heritage of Belarus and in connection with the 75th anniversary, Metropolitan Filaret of Minsk and Slutsk, the Patriarchal Exarch of All Belarus, was sent the letter of commendation from the President of Belarus in 2010.